You usually do what you want to, don’t you? What if you wanted to build better habits? If you wanted to, you would. If you did, you’d find that you were feeling stronger and enjoying the energy you need for living well. Who cares if you want to eat junk and sip soda sugar? Before you drop your spare change in the vending machine, consider what’s at stake. Even as you sleep, your body’s working hard clearing waste and toxins from your brain (wonder if a lack of sleep contributes to “stinkin’ thinkin’”?). Your body is a magnificent structure! It works diligently to keep all your systems running 24/7, just like shiftworkers do for the pipeline system. Here are three super simple steps for building good nutrition habits. Read them and apply them. In a short amount of time, you’ll realize the positive side effects of taking these simple steps and will find yourself wanting to eat this way on a regular basis. Start today! First and foremost, keep your body hydrated. Water is the most important nutrient of all. Your brain, muscles, and organs are composed of mainly water. Without adequate amounts of water, your systems can break down over time and you begin to experience the negative side effects of dehydration. Caffeinated beverages and alcohol can contribute to dehydration so it’s important to drink those in moderation. Aim to consume two liters of water each day. Secondly, eat small portions frequently. 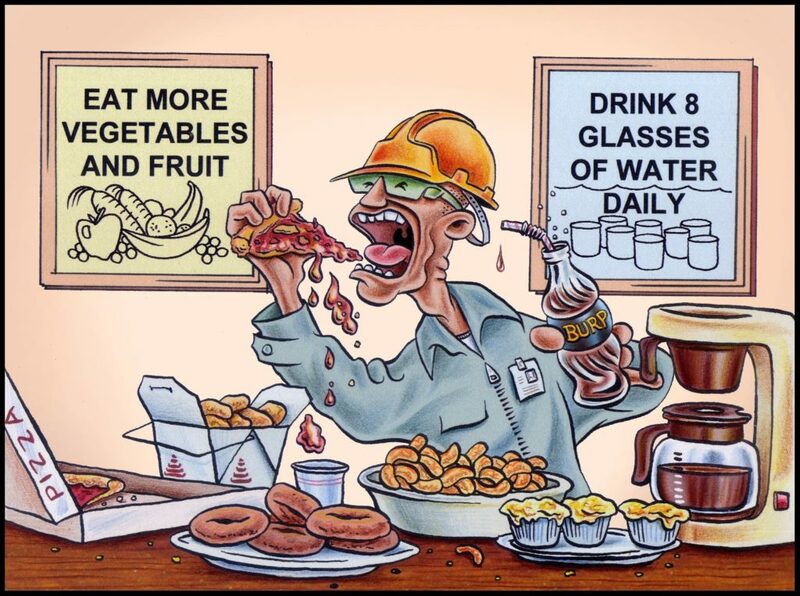 Food is fuel for your brain, heart, muscles and organs. Small portions are easily digestible, which is especially important at night when your digestive system naturally runs at a slower pace. Small portions, eaten every few hours, provide a constant source of energy. Thirdly, consider what you’re eating in each of those small meals. When each meal includes protein and complex carbohydrates, your body receives the fuel it needs for both quick energy and sustained, slow-burning energy. Protein builds and repairs tissue, while carbohydrates provide power for thinking and moving. For best results, keep the fuel clean, not highly processed. Finally, remember that your body is designed for movement. Movement is a great way to stay alert, and it aids digestion. Walking is a simple movement and is very effective in building good health. Walking, along with other kinds of exercise, helps you burn calories and control your appetite. Now that you see how simple it is to develop good nutrition habits, are you ready to begin today?